Persephone H - Butternut Squash Risotto with Crispy Coppa Ham - This is the first time that I have visited Persephone H before and it is a lovely blog. This meal is a favourite of mine and one that I find that the whole family enjoys. The crispy coppa ham must be the perfect topping for this dish. I hope to see more recipes from Persephone H! Everyday Made Fresh - Strawberry, Peanut Butter, Chocolate Muffins - Do I really need to say any more? I adore the sweet and salty combination of strawberries with peanut butter so these muffins sound like a dream bun! I really must make these on a weigh in day so I can have a treat, or two! Sneaky Veg - Pippin Pie - There were two reasons why this recipe stood out for me. One it was made with cooking apples. My mum and dad always get lots of cooking apples ready in their garden at this time of year so I am always on the look out for new apple recipes. Secondly the recipe was written for the Audley End Apple Festival. This brought back a lot of childhood memories of visiting Audley End! JibberJabberUK - Smoked Haddock Florentine Bake - When I saw this recipe I immediately thought of my hubby. He loves smoked fish and I know I do not cook it often enough. This is mainly down finding a different recipe that we would all like. But I think I may have found it now! I am sure everyone would love this so I will definitely be giving it a go! Thank you to everyone who joined in. This week CookBlogShare is hosted by Kerry at Kerry Cooks. I cannot wait to see what you have to share! 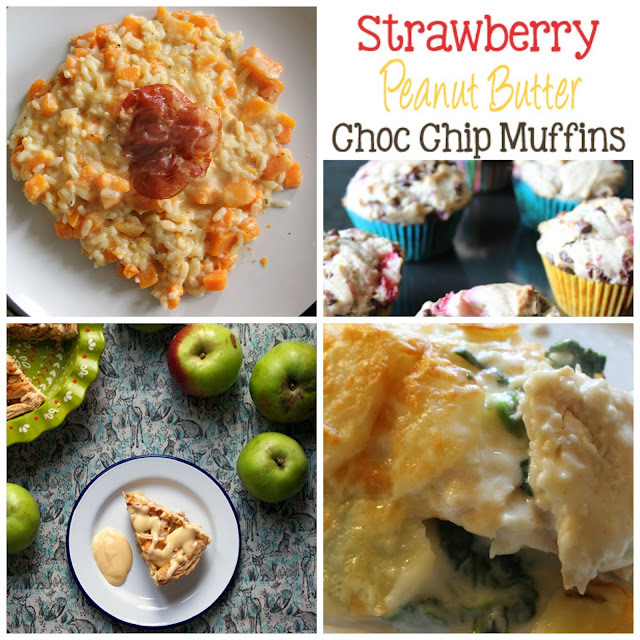 Thank you so much for featuring my strawberry chocolate chip muffins! Thanks for featuring me. I love the name of the Pippin Pie and what it contains.